1940 Census Will Be Free on Ancestry! Recently, Texican and I , along with our daughter, Texichick, made a trip to te Droop Mountain Battlefield State Park, located on Droop Mountain in southern West Virginia. Here the air is still alive with the terrible clashing of Union and Confederate troops. Located in a field at the top of the mountain stands a lone flag pole from which hangs the US Flag and the WV State Flag. Over in one corner of the field, one can easily overlook the two markers that stand alone. Commemoratives of two fallen Confederate hero's of a bloody battle fought in November of 1863. One stone commemorates John D. Baxter. While the stone does not commemorate a grave, it is a marker showing where the individual fell during the battle and died. At the top of the marker is a photograph of the individual, in Military Dess; and at the bottom is a bronze plaque. Photograph of John D. Baxter. While John D. Baxter is no relation to me, the atmosphere at this park is one of great reverence for all of the fallen here. This marker, and one other like it, add a face to the fallen. 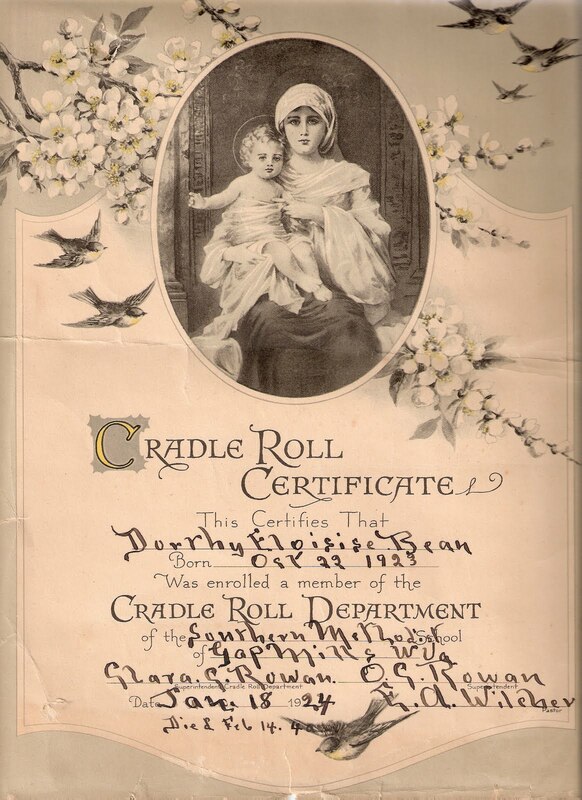 The above Cradle Roll certificate was for my Dad's sister, who died as an infant following contracting tuberculosis. 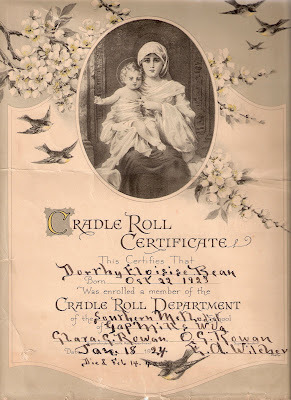 Here we see the Cradle Roll lists her in January, and someone added her death date and time just below that. Week 35: Weddings. Tell us about your wedding. You may also talk about your future wedding, the wedding of a relative or shape this question to fit your own life experience. I loved this challenge! To get to talk about our wedding day is always so much fun! I met the Texican [aka: Johnnie Lee Henry] at a time when God knew to send him into my life. I was literally sick, and dying. I had been diagnosed with terminal lung cancer and had been given a prognosis of six months to live. My eldest child was 17. My youngest was 12. I was literally at the lowest point in my life when Texican showed up. We were penpals first. Then phone friends. But when we came to face to face, well... we've seldom been apart since! We set the date for Friday, February 27, 1998. We were simply going to elope. But before we knew it, we'd told not only the kids, but my sister, and my parents. I, of course, told me best friend. So, we talked to a minister in Covington, Virginia and we headed there for a small, family only ceremony. Well, we ended up with three of the children in attendance [2 were away in school], my parents, my sister and her husband, her daughter and son-in-law, and my good friend Leslie. For a grand total of 9 attendees. We were all at the church waiting for the minister to show up. We waited forty-five minutes. And he still wasn't there! Finally Texican called him. The minister had thought it was a gag! He had talked to me on the phone and took my appointment seriously, until I had told him our names. And then simply erased it from his date book, thinking it was a prank! I mean, I can't imagine why??? My sister's son-in-law video-taped the ceremony for us. While my sister took still photo's. The three children who were home stood up with us as witnesses. I did wear an ivory tea dress, and my sister made me a veil. It was a celebration. Of life anew. For both of us. On the far left is son Mike, son Chris, the minister [from the back] Rev. Jackie Hollowell, Texican, me, and daughter, Texichick. You can just make out my parents, and my niece seated in the second pew. Immediately following the ceremony, we left for a week long honeymoon in the Natural Bridge area of Virginia. We also visited the two children who were away in school and unable to attend the wedding. Miraculously, shortly after we were married, x-rays revealed a dramatic change in the lung cancer. A biopsy confirmed that all that remained was scar tissue! I have since undergone several biopsy tests, and none have revealed anything more than scarring. I like to tell everyone that love healed me, and broke the bonds that cancer held on me. Love. A higher power. A miracle. My wedding wrought a change that made me a stronger woman. One that I know can survive anything this life puts before me. And that's one reason why I love to talk about my wedding. It was a simple affair. No great music was played. No cathedral in which we stood. No designer gown was worn. But love wrought a change in two people's lives. PERKINS. He married Mary Elizabeth FAUDREE in Alleghany County, Virginia. 5. Mary Elizabeth FAUDREE was born on 03 June 1897 in Sweet Springs, Monroe County, West Virginia/ SHe was the daughter of Stepehen Ledford FAUDREE and Elizabeth CARNEFIX. James PERKINS was born on 21 Nov 1741. He died on 25 Mar 1825 in Greenbrier County, Virginia. 37. Elizabeth BONDERANT. She died 1832. Granny was born Irene Caroline Banet on 24 May 1906 in Indiana to Francis Isidore Banet and Adeline Josephine Eve. Granny married Grandpa, Henry Condar Dreher, Jr. [1902-1977] on 12 Dec 1923 in Indiana. The couple had five children: Ethel, Art, Marion, Billy, and Lois. Sadly, Grandpa died in 1977. A year later Granny came to live with our family in West Virginia. She moved into a small house trailer that my [first] husband and I had bought when we were married in 1975. A tiny home, but Granny made it seem warm and inviting, and often entertained guests, even out of town guests! How I've yet to figure out, but Granny was talented that way! As she was getting older, her eyesight began to fade from cataracts. Mom tried to interest her in something small to collect, as it was getting more and more difficult for her to see to do the needlework she'd always done. Somehow, an owl collection began. When Granny passed away in 1989, she left behind hundreds, if not thousands, of tiny little owls statuettes. Each family member was given one. I chose a very simple one that came from Mexico. This diminutive fellow stands a mere 1-1/2 inches tall. His eyes are mere dots of black onyx! He sits patiently watching my family's going to and fro from a shelf on the china hutch, amongst a forest of crystal goblets. Each time I see this wise sage, I am reminded of the love we shared with Granny. A simple country woman that wise in oh so many ways! [the rest of stone is illegible]. Virginia M. KESSINGER was born 20 Mar 1865 in Gilmer County, West Virginia to Wilson KESINGER and Sarah BEAN. Virginia married Charles P. NORMAN [b. 1858] on 20 Nov 1879 in Gilmer County, at the age of just 14. One year later, on 13 Nov 1880 she had a son, Wirt. P. NORMAN. The tombstone above shows her date of death as "Jun", which is as far as is legible. We would presume this means she died in June. And Fannie Beane in "William Beane and His Family of Monroe County, West Virginia" lists her date of death as 03 Jun 1881. However, death records, both the original handwritten, and a typed index, in the county, show her date of death as 15 Apr 1883. It also shows her name as "Lina" [most likely a nickname]. Virginia is buried on the old Kessinger family farm located in Gilmer County, WV. My Mother is such a doll! In 1995 at the age of 57 she suffered a brain aneurysm that has kept her physically incapacitated, mentally robbed her of her more cognible skills and thoughts. Through it all, she has kept the sweetest of dispositions. She is seldom without a smile. And her only thoughts are of her Savior and loving her family as muh as she can with whatever time she has left upon this earth. This post is for my "Mommy", and all of my grand-Mommy's who came before her! was born in Georgetown, FLoyd Co., IN. She was the daughter of 6. Henry Condar DREHER Jr. and 7. Irene Caroline BANET. She married Walter Maxwell BEANE in Presidio, San Francisco, CA, son of John Monroe Bean, Sr. and Mary ELizabeth Faudree. Irene Caroline BANET was born 24 May 1906 in Indiana. She died 08 Aug 1989 in Gap Mills, Monroe Co., WV. She was the daughter of 14. Francis Isidore Banet and 15. Adeline Josephine EVE. She married Henry Condar Dreher, Jr. in Georgetown, Floyd, IN. Son of Henry Condar Dreher, Sr. and Sophie Josephine Benzel. was born 11 Feb 1867 in Indiana. She died 05 Nov 1958 in Indiana. She was the daughter of 30. Joseph EVE and 31. Annette. She married Francis Isadore Banet in Indiana. Son of Isadore Banet and Rosalie Sprigler. Annette was born 12 Feb 1840 in Indiana. She died 01 May 1870 in Indiana. She married Joseph Eve in Indiana. So, this IS my matrilineal line as far back as we have been able to trace to date. Following the mother's, I go back to Annette, whose parents we do not know. It's quite the story! And I look forward to one day finding more of this line! Week 34: Smells. Describe any smells that take you back to childhood. These could be from meals, fragrant gardens, musty basements, or something entirely different. 52 Weeks of Personal Genealogy & History by Amy Coffin is a series of weekly blogging prompts (one for each week of 2011) that invite genealogists and others to record memories and insights about their own lives for future descendants. I am so happy about this challenge! It is one that I simply love! The idea that a smell, an aroma, can take us back to a place or a time that means something to us. Good or bad. I suppose the number one smell that can take me right back to my childhood is the smell of bacon frying in a pan on a woodstove. If you've ever smelled that distinct aroma, you'll know what I mean! It simply isn't the same smell when it is being cooked on an electric range! As a youngster, both of my Grandmother's cooked on a woodstove. As I got a little older, Grandma Dreher got a gas, and then an electric stove. But at Grandma Beane's house, the smell of bacon frying was always on a woodstove! Occasionally we'd take a trip to my Aunt Veda's in Bumpass, Virginia. Aunt Veda was a "gourmet" of country cooking. [She was the Paula Deen of the time to her community and family!] She made the best breakfast's in the world! She had the bacon, but also sausage, and ham slices! And for the menfolks, there were also ham steaks, big ol' thick slabs of ham cut into steaks! And instead of the regular brown or cream gravy most of us usually got at home, Aunt Veda made red-eye gravy from the ham. [You have to have eaten red-eye gravy to know it's allure! But it's a delicacy , especially in the south. And Aunt Veda and Uncle Melvin lived right in the heart of the pre-Civil War plantations!] To sit down at a breakfast at Aunt Veda's table, was equivalent to sitting down to a breakfast at a big ol' southern plantation prior to the Civil War. The table literally groaning with food, you simply wouldn't know where to start first when it came to eating! So, here are three of my favorite smells that can transport me back to another time and place. There are of course many more! The smell of rain coming down in the spring; a cherrywood cigar burning; White Shoulders cologne; spray starch; roasting peanuts; and oh so many more! What scents can transport you to another time and place? My Grandma Bean gave me this picture many, many years ago. It's been tucked away in a desk drawer, even folded once and put into a book! A couple of years ago, I saw a reproduction of this painting on canvas. It gave me the brilliant idea to mount the picture on canvas, and do [oh! gasp!] the unthinkable. I decoupaged the picture to canvas, in hopes it would last, at least through my lifetime! Grandma was a Methodist, and so the how, or why, she had a paper printing of the Madonna is beyond me. It wasn't a sentimental picture to her, it simply was a pretty picture depicting the mother of Jesus, and she thought I would enjoy having it. This picture now hangs in my bedroom, where I have started a small collection of Madonna and Madonna and Child pictures. I enjoy the thought of a loving Mother looking over us. And although I am not Catholic, I find the Madonna comforting. Much like the writer in "Beneath The Tuscan Sun", I think of her not as "Mother Mary", but as perhaps, my favorite aunt. So I have an "Aunt Mary" who watches comfortingly over me as I sleep! Do you have any family treasures that are kept in your bedroom as they bring you comfort or comforting thoughts while you sleep? son of 1360. Jakob SPAHR and 1361. Anna Barbara STIBLE. He married Maria UNKNOWN. 681. Maria UNKNOWN was born 12 Jun 1675 in Wuttemburg, Germany. Jakob SPAHR was born in 1646 in Altenburg, Schwrz, Wrtt, Germany. He was the son of 2720. Jacob Jerg SPAHR and 2721. Maria KAHRER. He married Anna Barbara STIBLE. 1361.Anna Barbara STIBLE. She was the daughter of 2722. George STIBLE. Wuttemburg, Germany. He was the son of 5440. Jacob SPAHR. He married Maria KAHRER. Germany. She was the daughter of 5442. Claus KAHRER. Granny, born Irene Caroline Banet, was a second generation American. Her father's parents had been born in France. And it was this French country cooking she grew up on. Then she married my Grandfather, who was also a second generation American. However, his heritage was German! Combine these two distinct forms of cooking and eating, and you have fine cuisine that is often smothered in rich, creamy sauces and gravies! 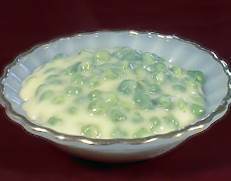 One of my favorite dishes was Granny's fresh creamed peas. I've tried to make them without using the high fat content which she used, but it simply isn't the same! So, on occasion, I simply have to make creamed peas, just to remind myself what a great food heritage I come from! After peas have been blanched, allow to cool completely before proceeding with directions. Then, place peas in a medium-sized heavy sauce pan. Add 1-1/2 cups of the cream. Heat thoroughly over medium-low heat [heat slowly so that the cream does not burn]. Granny always served this as a side dish, but I have to tell you.... I have made this the main course of my meal many times, by utilizing the peas for my protein source, and pouring the entire mixture over toast or biscuits! Yum! I've tried making this with just whole milk, or evaporated milk, and the taste is simply not the same. There are some dishes you simply cannot cut the fat and get to taste the same! The following story is taken directly from my Aunt Rita's memoir's. Aunt Rita was born in 1896. She was the eldest of my Grandpa Bean's fifteen children. I used to love to sit for hours and listen to her talk about the "old days". She was one of the most genteel ladies I had ever known.
" I got home in June. Papa was buying a Ford, he paid $500.00 for it. He took it out one P.M. and thought he knew how to drive. We were going to Aunt Florences for cherries. Lama wanted to go, but Papa made him take the load of lumber to Waiteville and we started for cherries. John and Emmette in the back seat Papa and I in front. We did fine until we got to the toll gate (a pole across the road that one had to pay 10¢ for someone to raise the gate to get under); proceeds used to keep road repaired). Papa forgot how to stop the car, it went under the toll gate taking it with us. That in some way pulled Papa over the back of the seat pulling his foot off the clutch. The car ran up on the bank and turned over, it thru me in a rut that the road scraper had made just enough to keep the seat back from crushing my chest. Papa got out some way, but John, Emmette and I were under it. 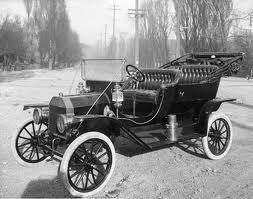 We had passed a buggy just before the wreck. Roscue Rowan was driving the buggy, he lifted the car off of me. I wasn't hurt, scared to death and bruised. Papa's back was hurt and [he] had to go to the hospital later. He never drove a car again as long as he lived. The top was torn off the car, but no other damage. After the car top was repaired, Lama and I went to a tent meeting at Hollywood. We went up a long mountain when we got to the top, the exhaust backfired and we were sure someone was shooting at us." I remember Aunt Rita telling me this same story. She said that Grandpa was so scared and frightened by the accident that he never drove again. He kept a car for many years, but never got behind the wheel again. By the time my Dad came along, Grandpa continued using a horse for transportation, and by the 1940's, relied heavily on his sons to drive him wherever he needed to go. Grandpa was born in 1866, the year following the Civil War's end. He married first to Aunt Rita's mother in 1895, and they had 3 children before she died with tuberculosis. He next married in 1907, and this time had 9 children. His second wife died, following the birth of the ninth children, due to toxemia. He was now 63 years of age. In 1935 he married my Grandmother. He was now 69, and his new bride was 38. The two went on to have three sons together. The last being born in 1943 when Grandpa was 77 and my Grandma was 46. Grandpa died in 1954, and my Grandma in 1975. They are both buried at New Zion Union Church Cemetery, in Waiteville, Monroe County, West Virginia. *Inspecting a broken stone in a family cemetery. Sarah A. Bean was born in Monroe County, [West] Virginia to William Bean and his wife, Rachel Wiseman Bean. She was one of 13 children born to the couple. Sarah married Wilson KESINGER [1819 - 1892] 16 Nov 1840 in Monroe County. The couple had 13 children, 9 of whom were born in Monroe County. One after a brief move to Craig County, Virginia, and three after their move to Gilmer County, where Wilson and Sarah built a farm life for themselves. Several of the children move west to Kansas. In 1894 Sarah made her second trip to Kansas to visit her children. 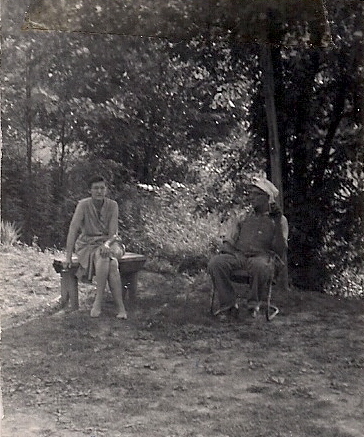 During her return home she stopped in West Virginia to visit a daughter before heading across the hills to her home. Her son Calvin wrote a letter stating she had enjoyed her visit with the grandchildren, eaten a good dinner and went to bed. She died in the night. Her body was carried across the hills to the family farm, where she was layed to rest beside her husband. Although this photo depicts the stone marking Sarah's grave as broken, current owners of the farm, although not relatd, have restored the gravestones for the Kesinger cemetery on the farm, and built a protective split rail fence around the cemetery to prevent any damage. This is one of thos lines in my family tree of which I know absolutely nothing at all! I am hoping that one day the brick wall will come tumbling down, and I wil get a rare glimpse into a past that will introduce me to my ancestors! 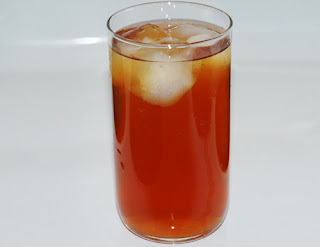 Is there anything more refreshing on a hot summer day than a glass of sweet tea filled with ice? Bring a gallon of water to a boil. [Yes, the entire gallon!] As it comes to a full boil, remove from heat [she used a wood stove! ], and immediately add 18 tea bags. Yes, 18!!! Add 2 cups of ganulated sugar. Yes, two! Stir to allow the sugar to dissolve. Cover the pot and allow to steep with tea bags for a full 20-30 minutes. When steeping is complete, remove cover from pot, pour tea into a one gallon glass jar [with lid available!]. From this you can pour the tea into your glass filled with ice. Now this is not complete until you grab a chunk of left over cornbread, and sit on the porch swing an enjoy the two together! Now THAT is a summertime treat you just can't get in no big city! And a pleasure you can't get from candy bars, bags of chips or soda pops!!! Grandma Bean and I used to sit on the porch and enjoy this every summer! What a wonderful memory I have of that special time together!! !